Kaichi looks out at the window to his villa. A long stone path leads to the frontdoor. The villa is surrounded by high fences with sharp edges. These are to keep out unwelcomed visitors and lurkers. The front garden looks big and fancy. There are small trees with fuits and flowers. In a corner you can see a fountain with a fairy statue in middel. Though it is empty right now. Kaichi glances back at livari. "Yes, I live alone here. Would you like to come in? I'll treat you, as thanks for driving me home. Also, I have a pool in the backyard. Sorry to cause you trouble today. I allow you to swim in my pool as apology." he said with a serious tone, like a gentle men. It may be strange that he has pool, but this building was the only one that matched his taste, so he bought it. Iivari just kind of stares at him. This was beyond weird. "Ummm.... Kaichi? I don't mean to be rude but... how do you afford this house and take care of yourself?" He was genuinely worried about him. Was he doing alright by himself? Should he call the police? Kaichi rubs his chin, thinking of a good answer. Of course he cannot tell the truth that he's actually a demon with powers and make money from using magic. "I won a fortune from a lottery. It was just luck. I have enough money for lifetime." Kaichi opens the cardoor and jumps out. "I have hired people who work for me. They are waiting, so let's go." Actually he didn't "hire" people, but summoned a guardian. It's like his personal pet, but too weak for combat. He sighs lightly. The books from livari's library helped him discover his powers, but also weaknesses. He turns his head and glances at livari. "Hey, are you coming?" After a moment, they reach the door. Kaichi takes out a key from his pocket and opens the door. After they enter the entrace, they stand in a giantic lobby. Iivari stares in shock at all of the beautiful things in this huge house. He had won the lottery? Did Green Falls even have a lottery? Maybe he had won it somewhere else. At least there were housekeepers taking care of this boy. "May I talk to one of your housekeepers? I'd like to tell them what happened if you don't mind." Really, Iivari just wanted to see if there was actually anyone here taking care of this boy. He wasn't very good with kids but he knew enough about them to know they shouldn't be left alone even if they are rich. Kaichi enjoys livari's suprised expression. This guy is really funny. He leads them to the living room and points a big fancy chair, which looks big enough for three people. He makes a gesture to sit down. He sits down on an other chair opposite of him. between them is a big table. "So you want to talk with one of my housekeepers?" He raises one eyebrow, thinking it's strange. Well, whatever. I wonder what he's going to ask. "I have currently two housekeepers working for me. Let me call my butler." Kaichi turns his head and looks at the big stairs. "Shikiyo, come here." After he called his name, it remains silent. Nobody is coming. "Strange... I wonder why he isn't coming. Whatever I call my maid, Yokishi." 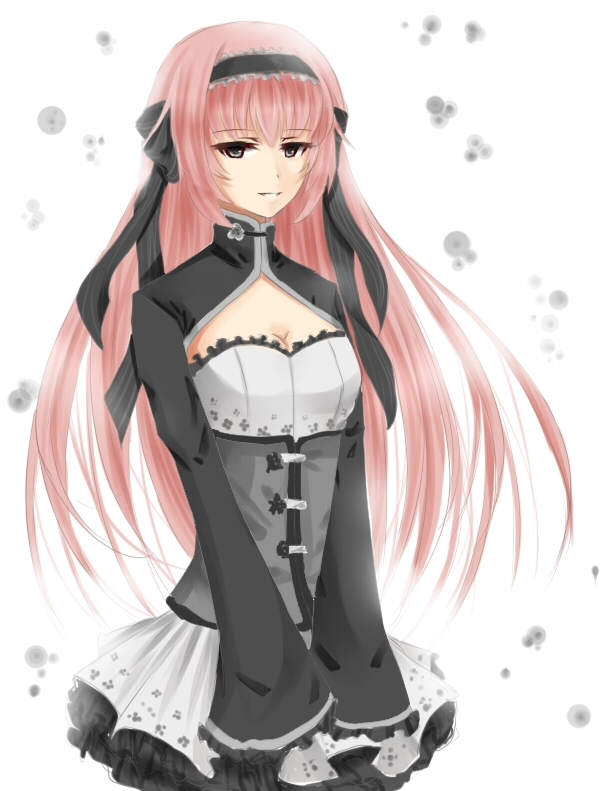 Within a blink a maid popped up behind Kaichi's chair. She stands besides him and bows to her master. "Yokishi, this is livari. Livari, this is Yokishi." Kaichi introduces them to each other. Iivari reaches out and shakes her hand. She was really cute. And her hair was pink! He had never met anyone else with oddly colored hair before. It looked nice on her. "It's nice to meet you Yokishi. I found Kaichi by the pool and brought him home. I just wanted to make sure there was an adult home before I left him here." Yokishi covers her mounth with her sleeves and giggles. "Nice to meet you master livari." She looks at him from top to down and after lower her arm. "Thank you for bringing him home. He is sometimes such a trouble. Lately he's barely at home. I wish he is more often at home because I..."
Kaichi's eyes dilated. "That's enough Yokishi." he said sharp. She stopped immediately without finishing her sentence. Kaichi glances at livari and smiles. "Would you like something to drink?" Yokishi left quickly and head to the kitchen. Iivari gives Kaichi a disapproving look. "She was fine. Why did you make her leave?" That was a horribly rude way to treat anyone, even if they did work for you. And she seemed so nice. Iivari would have been happy to talk with her and he wasn't exactly the type who was big on talking. Was she about to say something Kaichi didn't want him to know? Kaichi sighs and avoids eyecontact with livari. "I still need to "train" her." It was a short time ago he learned to summon guardians. It is tough to control them but you managed to summon two. They are evolved with Kaichi's life, but ofcourse they don't know everything. "Yeah, I do have secrets. The housekeepers arent supposed to leak that out." He glances back at livari and grins. "About the way I treat my people is not your business. They wont complain no matter what I do. Even if I torture them" he says in a sarcastic tone. It may sound weird to hear that from a kid. A moment after Yokishi comes back with teacups and a teapot. She puts them on the table and pours tea in the cups. "I hope you like peach flavored tea. It's my masters' favorite" she says with a smile to livari. After she goes to Kaichi and bows her head. As she bows, Kaichi raises his hand and pats her head lightly. "Good job." Yokishi looks up slowly at him and smiles happily at her masters' praise. After all, Kaichi treats girls nicely. Iivari takes the tea and mutters a quiet thank you. He looks at Yokishi with sad eyes. No one deserved to be treated like that no matter what Kaichi said. He looks away from her to Kaichi. She was brainwashed by this little boy? How much power could he have over such a nice woman? Was she his caretaker or was he hers? "They are human beings Kaichi. They deserve respect no matter what the circumstances. No matter what position you're in you never treat someone as anything less than a person." He says sternly. There was nothing he hated more than someone treating someone else badly because they thought they were above them. He takes a sip of his tea and turns back to Yokishi]. "Thank you Ma'am. The tea is delicious. You are a very talented housekeeper. Kaichi is lucky to have you." Yokishi stands idle besides Kaichi, like a royal guardian and it's master. Kaichi lift his head and looks at her for a second, then back to livari. He doesn't know how much trouble it is after releasing a guardian. He leans on a hand and his mind wanders off, thinking about the first time he met Yokishi. Yokishi is the first guardian he released. It was exciting and scary at the same time. After he drew a magic circle, a girl with pink hair climbed out of it. She looked beautiful... and naked. Kaichi had not realized yet that he summoned a guardian and treated her like a normal girl. He quickly covers his eyes and turns his back. In a moment she crawled to him and hugged him from behind. "Master" was the first word she spoke. Her hands fumbled around his chest and unbuttoned his blouse, then it reach for his pants. Kaichi quickly turned around and steps back. "W...wait... what are you doing...?" he asked with a blushing face. The girl smiled and jumps happily infront him, hugging him again. "Master" she said with a happy voice. Kaichi sighed and patted oh her back. "From now on I'm your master, right?" She nodded as reply. "I shall give you a proper name. What about Yokishi?" She smiled happily as answer and her hands reach to his pants. "N...no! Don't do that!" Kaichi quickly grabbed her hands and blushed. "What kind of guardian are you? Don't tell me that you're a sexslave or something." Yokishi tilted her head and looks at him with a questioned face. "Eh?" was her answer. Kaichi releases her hands and turns his back. "I'll get you something to wear." After this Yokishi works for him as maid in his villa. Kaichi noticed her weird habits since their first meeting. He has no clue about her background. A short moment after he summoned Shikiyo, an other guardian. "Shikiyo..." the words came softly over Kaichi's lips. He noticed that he's staring blankly for a while. "What is "treating good" in your opinion, livari? Something like this?" Kaichi shoves a little aside and makes a spot for Yokishi to sit. Yokishi bows politely and sits besides him. "Now she doesn't need to stand" He almost sound sarcastic. Of course he treats people nicely, but also have to punish them if something goes wrong. That way they'll learn from it. Yokishi smiles at livari's praise and glances at Kaichi. "Thank you! I'm also lucky to be with my master." Iivari glances over at the two sitting side by side. Something wasn't right about her. She didn't seem to have any will of her own. It went beyond what was expected of a servant, she was completely and totally brainwashed. It was sort of creepy. Like he controlled how she thought. "Yokishi, how long have you worked for Kaichi?" How long has he had to break you down? Kaichi glances at livari and stays silent. Why is he asking so much questions about me to Yokishi? He sighs lightly and takes his teacup and drinks his tea quietly. Yokishi turns her head and looks at Kaichi. She rest her chin on a hand and seems like thinking. "Hmm... I don't remember. Sorry that I'm not able to answer you question." She shows a weak smile as apology. "Well, would you like to swim? I made the pool in the backyard ready." She stands up and is ready to go, but suddenly Kaichi grabs her sleeve. "Yoki, maybe you can join him. Since I'm not gonna swim he would be alone. It's funnier with more people." Kaichi grins to livari. "Are you ok with it?" Iivari wasn't really in he mood for swimming but he had to know what the deal with the servant girl was. And since he was already in his swimming trunks... "Of course. Thank you for the invitation." He allows Yokishi to lead him out to the pool. It was a beautiful and well kept place. He looks over at Yokishi. "Do you need to go get a swim suit?" Kaichi follows them to outside. He takes a seat near the pool, a perfect spot to view everything. "livari, maybe you should pick one for her" he said a little teasingly. "Master! That's a little embarrassing..." Yokishi answered with a suprised tone. "Don't worry about it." Kaichi smiles softly to her. "Okay master!" Her expression changed to cheerful. She glances at livari and grabs his hand. Together they go upstairs. She opens a door which lead to a room filled with clothes. "Ah here they are." She points at a few bikini's on a mannequin. "Which one suits me the best?" she asks with a smile. Iivari looked at them. Did it really matter? They were just swimsuits. He was not at all a fashion expert. He points to a light pink one. "That one would suit you well I believe." He still didn't get the whole bathing suit thing but she seemed to be having fun so why not go with it? Honestly she would look nice in any of them but Pink matched her hair. He liked her hair. Made him feel less like a freak with his purple hair. "Ohh that's a cut one!" Yokishi takes the pink suit. The back was tied with laces and ribbons. She noticed that he stared at her hair. "Uhm is there something wrong with my hair?" he asks with an innocent expression. "Anyway I gotta change." She started to undress infront of livari. Meanwhile Kaichi stares at the pool and leans back on the chair. I wonder what they are doing now. Hopefully is Yokishi doing something fun to him. That guy sure looks really shy around girls. He needs a little push in his back. Kaichi chuckles amused. Yokishi is still unexperienced with human, hopefully livari will be alright. Iivari turns bright red and looks away, completely in shock. "U-ummmm.... Should you really be doing that when I'm around?" He was so uncomfortable he had reached a whole new level of uncomfortable than he had ever felt before. And he had been pretty uncomfortable before today. Was she completely sane or did she honestly just not care? Either way he just wanted to die right there that second. Yokishi unzips the dress and let it glide down. "Uh?" She turns over to look at livari. "Are you okay, master livari?" she asks in an innocent tone, then she giggles lightly. "Haha, you're just like my master." She puts on the swimsuit and walks over to livari. Suddenly she hugs her from behind. "Would you like to change too? We have some swimming trunks over here. My master don't use them anyway. Hmm I wonder why." Her hands reach for his pants. "Let me help you!" He left out a deep sigh. Why are they taking so long? Could it be that... Suddenly he started to worry. He stands up and goes to the dressing room. I wonder if she didn't ate him or something. I never left her alone with someone else, even seperated her from Shikiyo... Wait, could she have done something to him? Oh gosh, hold on livari! "H-hey! I've already got my swimsuit on! What are you doing?!" He was completely bewildered by what she was doing. There was no way this was normal behavior. Something defiantly wasn't right about this girl. He grabs her wrists and pulls them away from his pants. "No, don't do that. Please." She didn't seem like she understood. Like she wasn't completely aware.... Which is what Iivari WOULD have noticed if he wasn't busy freaking out. Yokishi released him immediately when he said to let it go. "Okay" she answers with a smile. At that moment Kaichi storms into the room, breathing heavily. "Hey, are you..." He stopped and look at them two. Yokishi standing there smiling and livari pressed on the wall. Eh...? He left out a desperate sigh. Actually he only want to leave them two alone for a second, wondering if livari will freak out. Well it looked like he likes her. He goes to livari and pats him on the shoulder. "Lets go to the pool." He grabs Yokishi's hand and goes downstairs. This girl is too optimistic... Even if someone stabs her, she would keep a smile on her face." Kaichi shakes his head. Oh well... It could work in advantage... He turns his head and glances at livari. His lips form a mysterious grin. Iivari glances down at Kaichi. What was with that look? Did his discomfort please him? "Whats that look for?" This is why he'd rather be at home with a book. He continues to follow Kaichi down to the pool. "I was thinking if you would be a good friend" he says with an innocent smile. Actually he just made that up, but it wasn't a lie. He really does want to become friends... Nobody could hold it forever alone. After a moment they reach the pool. He releases Yokishi and sits back in his chair. "Go play with him Yokishi" he says with a grin. Yokishi nods and takes livari's hand. She pulls him with her together into the pool. Iivari quickly holds his breath before going in and quickly swims to the surface. He takes off his shirt and throws it over the side of the pool. He looks around the pool. Where did Yokishi go? Kaichi looks at them having fun. It would be nice if he could swim too... He looks on his arm and stares at the pool. He noticed that Yokishi's been under water for a while. Who knew she could hold her breath for so long? Yokishi tries to hold her breath as long as possible. Heehee I gotta suprise you~ After a moment she pops up behind livari and hugs him. "Gotcha!" she says in a playful tone. Kaichi looks at them two. I wonder why livari is only shy around girls. Did he ever got a bad experience with them?